One of the last remaining pristine coastal rainforest areas on Peninsular Malaysia’s west coast, the Tanjung Tuan Forest Reserve is home to a spectacular phenomenon that takes place between the months of February to April – the spring migration of raptors that allows visitors to witness the soaring and thermaling of thousands of migrant raptors on their journey back to their breeding grounds in the northern hemisphere. Located just about 1.5 hours away from the Kuala Lumpur International Airport, this swathe of 607,000 square metres has been designated as an Important Bird Area (MY12) and an important site for birds by the National Geographic Society. Black Baza, Oriental Honey-Buzzard, Grey-faced Buzzard, Greater Spotted Eagle as well as the Chinese Goshawk and Japanese Sparrowhawk (during the migration season). Changeable Hawk Eagle, Large Green Pigeon, Dollarbird, Coppersmith Barbet, Greater Flameback, Banded Kingfisher, Black-naped Oriole, Blue-throated Bee-eater, Asian Glossy Starling, Asian Paradise-flycatcher, Crimson Sunbird and during winter migration season, Orange-headed Thrush, etc. 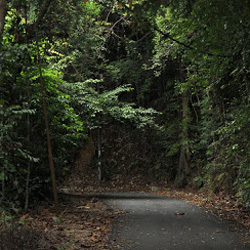 Just beyond the North-South Highway lies Melaka’s popular recreational forest – the Air Keroh Recreational Forest – about 15 km from Melaka town. 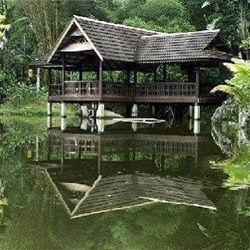 This tranquil haven for wildlife comprises 359-hectare secondary forest and is also the location of A’Famosa Resort which boasts of several themed attractions. Birdwatchers are in for a treat with the 135 bird species recorded at this little forest, and can even opt to get on to the observation towers as they provide a great vantage lookout for birds at treetops or by the lake, where waterbirds frequent. Black-thighed Falconet, Jambu Fruit Dove, Asian Paradise Flycatcher, Purple-naped Spiderhunter, Sunda Pygmy, Banded Woodpecker, Pink-necked and Thick-billed Green Pigeons, Stork-billed, Banded and Blue-eared Kingfishers, Buff-necked, Buff-rumped, Crimson-winged and Rufous Woodpeckers, Coppersmith, Gold-whiskered and Red-crowned Barbets as well as the Changeable Hawk Eagle and Crested Serpent Eagle. There are also three owl species here, namely Barred Eagle Owl, Buffy Fish Owl and Brown Wood Owl. The migration season that takes place from September to March, brings about other feathered visitors including the Black Baza, Oriental Honey-buzzard, Arctic Warbler, Blue-winged Pitta, Indian Cuckoo, Crow-billed Drongo, Black Capped and Common Kingfishers. The Dark-sided and Yellow-rumped Flycatchers also make their stopover at this forest reserve.